This post may contain affiliate links. We may earn money or products from the companies mentioned in this post. My puppy pees outside then pees inside!? What Do I Do? What do you do when your puppy pees outside then pees inside the house? Why does he have to pee twice…sometimes thrice in a matter of minutes!? I already raised 2 puppies before I witnessed this phenomena…or maybe I was somewhat oblivious raising and training Linus and Stetson (chalked it up as a regular potty accident)…or maybe I was more aware of what was going on (catching the potty accident before it happened). QUICK TIP: If your puppy has an accident in the house it’s important to clean it up with an enzymatic cleaner so your puppy won’t be able to smell the potty spot and be tempted to pee there a second or third time. We recommend Rocco & Roxie Stain and Odor Eliminator for cleaning up potty accidents. Shouldn’t I feel safe from potty accidents if my puppy already went potty? If you recently brought home an 8 week old puppy then you probably know what I’m talking about. The good news is you’re not alone. This is a common puppy potty training problem, but the question now is why does my puppy do this and what can I do to prevent it from happening. Look no further true believer (my inner Stan Lee coming out) as we present the solution to one of puppy’s little mysteries. Why Does My Puppy Pee Outside Then Immediately Pee Inside The House? If you go back to my posts on how to crate train a puppy and how to potty train a puppy (you should go through both of these articles if you haven’t already mastered potty training your puppy) and sift through the hundreds of comments you’ll find the answer to this question on several occasions. Today, you get the blog post version of that answer with awesome pictures illustrating the madness. The answer to this one is simple: Your puppy lacks bladder control. Your puppy has only been in this world for 8 weeks. What were you doing 8 weeks ago? Maybe hanging out with your friends, eating dinner, having a drink. This puppy was still in his mother’s womb 8 weeks ago and unfortunately his bladder is not yet fully developed. Your puppy finishes eating breakfast (we feed our puppies Wellness Core Puppy Formula) and you think this is probably a good time to give him a chance to potty. You step back in the house and immediately your puppy squats and another piddle underneath him. What the heck!?! Is this normal? Why did this happen? What can you do to correct this problem? Yes, this is totally normal. Don’t worry, you’re not alone. This happens all the time as witnessed by ME with dozens of puppies to my resume and as written all over this blog by you: the READERS. At 8 weeks of age your puppy does not have full control of his bladder. This means when you take him outside and he goes pee he does not always “get it all out” Almost as soon as you get him back in the house: squat, piddle, UGGHHH!!!! 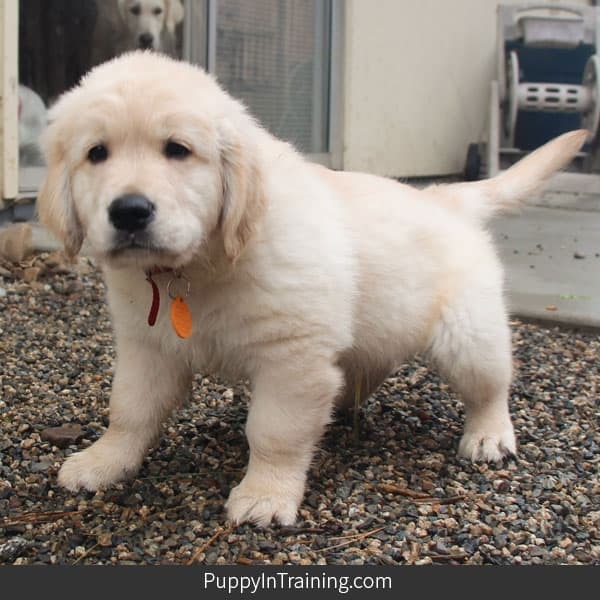 A puppy not having full control of his bladder explains many of the puppy potty training mysteries. Just think back to other accidents your puppy has had around the house. Sometimes it’s difficult to predict potty accidents because your puppy doesn’t exactly know when he’s going to have to potty until that very moment. QUICK RECOMMENDATION: If you’re having problems training your puppy we recommend Puppies for Dummies. This book will give you a solid foundation on how to raise and train your puppy. By the way, did I mention this was the first book we purchased before bringing home or first puppy, Linus? What Can You Do To Correct This Problem? The answer to correcting this infamous (if you’ve seen The Three Amigos then you know what this means) behavior: After your puppy does his business outside you praise him and then give him another few minutes to make sure he “got it all out”. There’s a good chance he’ll piddle a second time. If so, rinse, wash, and repeat till he “gets it all out”. While the answer to why a puppy pees outside then pees inside is not all that much of a mystery I think what we were all wondering is “Is This Normal Behavior For A Puppy?” Yes, your puppy is normal. The good news is as your puppy gets older he will have better control of his bladder which equals fewer accidents in the house and eventually “getting it all out” in one squatting. This coupled with teaching him the proper place to potty will have your puppy house trained in no time! One last thing to mention. We have on occasion come across puppies with bladder infections. If you think this might be a possibility you should take your puppy to your veterinarian for a checkup. That’s it folks! What do you think? Did we nip this one in the bud? Do you have any other puppy potty training questions? Do you have any puppy potty training answers? Tell us about your experiences in the comment section below. As mentioned earlier, always thoroughly cleanup when your pup has an accident with an enzymatic cleaner like Rocco & Roxie’s Stain and Odor Eliminator. Your puppy’s nose is thousands of times more powerful then yours and if he can smell urine he’ll want to pee in that spot again. 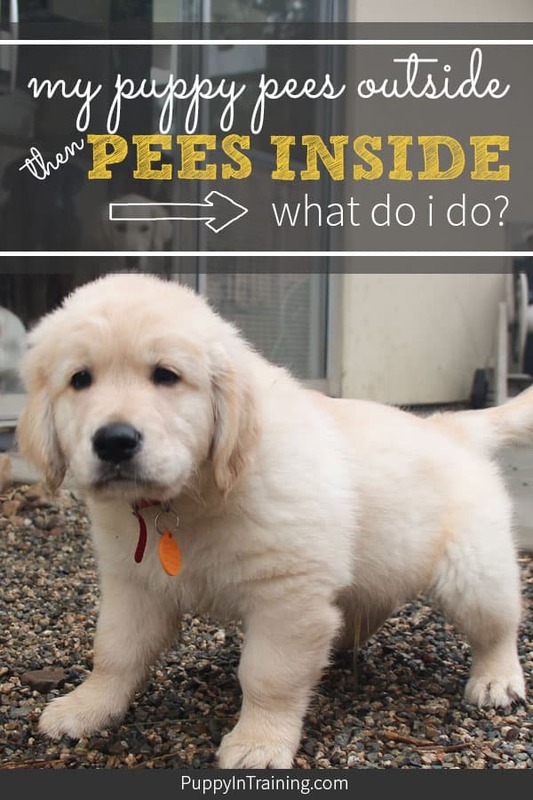 Manage your puppy’s behavior 100% of the time and you will probably catch that second potty accident before it happens although it can be tough because I usually let my guard down after my pup pees outside. If you can’t watch your pup when you get back in the house let him get some alone time in the his crate (we recommend the Midwest Life Stages Crates). That’s all folks! Let me know if you have any questions. My puppy pees outside then as soon as we come back inside he pees again!? What do i do? Across our entire website these puppy products have been the most popular with our readers over the last few months. Colby Morita has raised guide and service dog puppies for Guide Dogs of America and Canine Support Teams. He's been writing to the PuppyInTraining.com blog and sharing his puppy training tips from his experiences as a guide dog puppy raiser since 2007. We got a border collie blue heeler mix about a week ago he is going to be 12 weeks on Saturday and it seems as if he goes pee every 5 minutes and it’s reallt getting us down. To the point of giving him up because we can’t take the stress. We didn’t realize it was going to be this hard. Any tips and tricks could help. I read all of the comments. It’s tiring going outside every five minutes and we are becoming extremely discouraged like we won’t get there. It’s making us both miserable. He’s even peeing in his crate. My 13-week old puppy does the same. However, he won’t pee in his crate. I think that he gets distracted too easily and doesn’t get all of his pee out when he goes. I ordered some of the doggy diapers (he is a male, so it is the belt) to use when he is in the house and out of his crate. This is an experiment. I have no idea if it will work. My thought is that he won’t want to pee on himself, so he won’t go while the diaper is on. If he starts peeing in the diaper, I won’t use it again. I’m grasping at straws now. Something has to work. We’ve never tried the doggy diapers with our puppies. Let us know how it goes. No accidents today with the puppy diaper (and it remained dry). I was also able to let him roam free downstairs. I’ve always had to keep a close watch on him, so this was very refreshing. This is day one. It may be a fluke that he had no accidents. He’s going to the door and ringing his bell to go outside. I am hopeful that he has made a turn in training. My plan is to use the diaper until I feel that he is consistently going to the door to be let out. Then I will stop using the diaper. Fingers crossed. Hang in there. This has been so frustrating. That’s great to hear! Hopefully the doggy diaper continues to do the trick for you. Congratulations on your new puppy! Here’s a post that might help with the accidents in the crate: https://puppyintraining.com/how-can-i-get-my-dog-to-stop-peeing-in-her-crate/. If he’s peeing every 5 minutes then it’s probably a good idea to have your veterinarian check him out to make sure he doesn’t have a urinary tract infection or any other health issues. One thing I haven’t mentioned before is if you’re in extreme weather it’s possible that your puppy is not getting it all out when outside because he wants to come back in to the house. If this is the case then you should do your best to give him extra time to “get it all out” or have an alternate spot for him to potty. Hopefully that helps. Good luck with your puppy! Hey I feel for you. We got our puppy at eight weeks and for the first week I felt like the world was crashing down on me. What have we gotten ourselves into? Is this what life is going to be like from now on – worrying about the dog needing to go to the bathroom all the time? Maybe the breeder would take him back even if we have to forfeit the cost. Our puppy is now seven months and he still has an accident about once a week (mostly pee but recently poop). Most of the time he would let us know that he has to go, but sometimes I guess the accidents were “accidents.” He has pee in his crate in the past – I found out only after the pee has dried and smelling it. I only hope it gets better. The only feedback I can provide is what I’ve been reading and taught by other trainers. 1) Make sure the crate is not too large when crate training. 2) When out of crate tether the puppy to you. 5) When puppy goes inside immediately reprimand and take puppy outside. 6) If puppy has an accident immediately start from square one and crate train. All the above is plastered all over the internet and sometimes you say to yourself if only it was that easy. I suppose it depends on the dog as well. Some dogs just get it sooner than others. We do everything on your list except reprimand when there’s an accident. If we can catch our puppy in the act then we grab him immediately, take him outside, and praise if he finishes up outside. One thing I’ve learned over the years is the key to potty training is to not let your puppy have accidents in the house. The best way to do this is to monitor your puppy at all times when he’s in the house and if you can’t keep an eye on him then use your crate (hopefully you crate trained your puppy). That list is what we did with our Jack Russell Terrier puppy and we had no luck with her for over a year. We had resigned ourselves to accepting that she was never going to figure out what we wanted her to do with potty training, and yet she was brilliant in every other way. Then suddenly, she just got it. She hasn’t had an accident inside since that day. I think it was when she was about a year and one month old at that time. Keep doing the things on that list. Your dog will eventually figure it out. Some dogs just take longer than others. Even if they are smart dogs in other areas of behavior. We are glad that we kept her because she is now a great dog and we love her very much. Our puppy is 9 weeks old. He won’t pee outside, but as soon as he gets inside, he squats. Today, we either held him or took him outside for a total of about 4 hours. He never went outside, but after that period of time – it was late and cold outside. He came in and within 2 minutes he peed. Any suggestions? If he will go potty on something that you can take outside – towel, pee pad – take that outside once he has peed on it. If he smells it, maybe he will know to go outside. Someone else may have better advice. It is worth a try. We have the same problem, I think. We take our 10 week old puppy out every 1-2 hours. Everytime we open her kennel door she pees-so we stopped talking to her to try to avoid exciting her, or if we grab the leash she pees- so we try to hide the leash and put it on as soon as we go outside, she pees when she sees we are putting our boots and coats on. She will not pee outside. On the rare occasion we get her out side before she tinkles she waits until we come in the house to pee. I have tried not playing with her outside, I have tried praising her outside, I have tried ignoring he outside and she will still come in and pee shortly after we are in. I just bought doggy diapers and I am in hope that will help us train. Have you found any solutions? Or have any tips? I have a 5 month old lab/husky mix puppy who will pee outside with no problem. But she also likes to pee inside. It seems like she does it to be spiteful. She pees next to my feet, next to our gate, on the couch in the spot where I lay on the couch. We also have a 3 month old mastiff/Australian Sheppard mix who is completely potty trained to go outside and we have no problems with him. We potty trained them the same exact way and I dont know what else to do with her. They go out every 2 to 2.5 hours and she still continues to have these accidents. We took her to the vet to see if it was a bladder infection or a UTI. Everything came back negative. Please help me! If your 3 month old is already potty trained then if it were me I’d work consistently with your 5 month old. Keep an eye on her 100% of the time and catch any accidents before they happen. Also, make sure and cleanup any area she had an accident with an enzymatic cleaner. It’s likely she’s going back to the same places because she can smell urine. Remember a dog’s sense of smell is thousands to millions of time better than a humans. Hopefully that helps. Good luck with your puppy! I’m having the same problem with my 5 month old lab/malamute mix. We also have a 9 mth old bulldog mix, who was a breeze to train, which is why we decided on the 2nd puppy. The lab will go outside without a problem, but inside it’s like she either doesn’t recognize the need to go, or just can’t hold it. She holds it during the day in her crate (3-4 hours at a time) just fine, and no accidents over night, but outside her crate, it’s like she just doesn’t pay enough attention to it. And the places she pees are different every time, she doesn’t seek out a place to pee. She’ll just be too busy to remember she has to go potty. It’s definitely gotten better the last couple of weeks, but we’ll go 2-3 days and think we’re finally there, and then she’ll pee again, and we start all over. Congratulations on your new puppy! Potty training takes time. It can definitely be frustrating. Here’s an article on potty training that might help: https://puppyintraining.com/how-to-potty-train-a-puppy/. The number one thing we’ve noticed with our puppies is the fewer accidents (the more you can prevent) in the house the quicker they learn potty training. We do this by keeping them on their leash by our side most of the time in the house until they learn not to potty indoors. I have an 18 week golden retriever puppy who likes to pee in his crate. At first I thought it was because we had been putting a towel in there, but he will go in there whether or not there’s a towel. The crate is proper sized. He just doesn’t seem to care. He just lays down in it resulting in me having to constantly bathe him if there’s no towel to soak it up. He’s not having any accidents in the house anymore, although he peed on me while laying on my lap on the couch a few days ago and has also peed out of excitement (I’m assuming) while eating his food. I’ve just never had a dog who will pee and not care if he has to lay in it. I need help!!! My husband and I are exhausted from having to bathe him every day. What should I do? Congratulations on your new puppy! You probably need to re-train your puppy with his crate. After you thoroughly clean your crate with an enzymatic cleaner start by crating him for a very short period of time so he’s successful. As he continues to be successful in his crate slowly increment the amount of time he stays in his crate until he can stay in the crate without accidents. Hopefully that helps. Good luck with your training. Colby, how did you train your puppy to ring a bell when they need to go out? I’ll put together a full post on this one when I work with my upcoming service dog puppy. I can tell you right now the first thing I will do is teach my puppy the cue “touch”. Stay tuned for a more detailed answer in a future blog post. I have two 16 weeks old catahoula leopard print/pitbull mix litter mates…..One of them is already crate trained and does not have any accidents, the other one however is always having “accidents” but I noticed he only does it when he’s excited especially around men….what can I do to prevent that? When our puppies get pee when they get excited we try to make the situation less exciting. Something we do that you might try is just have any new guests (especially men) just ignore your puppy when they first come over. Also, tell anyone not to act excited when greeting your puppies. My puppy is 12 weeks and she comes to us and taps us to let us know she needs to go. But lately she has been tapping us to go and I get to the door and she has already gone. What’s the reason for this. We have a 15 wk French bulldog. He can hold it for over 5 hours but no matter when he goes outside, if we put him by himself in his crate, he pees again. It almost seems like he is being spiteful. He seems to have the poop down to only outside. He can lie with us on the bed for hours and won’t go, but we can take him outside and then put him into the crate, he will pee the moment we turn away. Can it be some sort of seperation anxiety or just plain spite? New Puppy Checklist - I'm Getting A New Puppy, What Do I Need? How Long Are Golden Retriever’s Pregnant?